A recent decision by the Australian government to cut income support for thousands of asylum seekers has meant the Asylum Seeker Resource Centre (ASRC) has reached breaking point. The ASRC relies on donations and has already almost run out of food for their food bank, which supports more than 600 people per week. Kon Karapanagiotidis, CEO and founder of the ASRC, decided it was time to open the ASRC to the public and, on a recent freezing winter Sunday morning, he put a call out on social media for donations of food, blankets and winter coats. Two thousand people turned up to the centre in Footscray to contribute food and clothing and Karapanagiotidis was there at the door to shake hands with each and every donor, thanking them for their contribution. Such is the power of hope. It is this that has inspired and kept Karapanagiotidis fighting, despite his own personal struggle with life. Mercilessly bullied and teased at school for being an outsider, he found solace in books, to which he credits his learning of empathy and compassion for others. His family life was also difficult and upon finishing high school, he was so filled with self-loathing and an inability to help himself, that he decided the best thing he could do was help others. Over the next decade he volunteered at several different charities while studying to become a social worker and eventually a lawyer. The ASRC was born from a TAFE class he was teaching called Community Work where he decided the class should start their own charity as a class project. 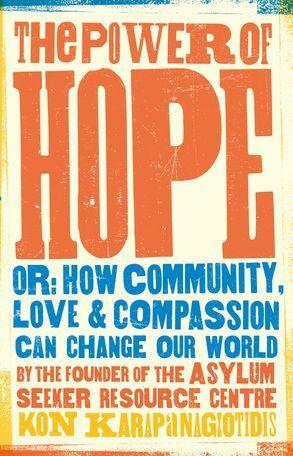 The ASRC is now the largest organisation helping asylum seekers in Australia. This is an incredibly personal, honest and moving book. Kon Karapanagiotidis wants to share the anguish and suffering he has experienced and the steps he took to overcome his shame in the hope that others will not have to suffer as he has. The last few chapters outline how the reader can make practical changes to help others as well as help themselves.